One of Alibaba Group’s affiliates, Ant Financial Services Group, and other investors have started a privately owned Internet bank, MYbank, to provide “inclusive and innovative financial solutions” at lower cost to small business and consumers. Other than Ant Financial, investors of MYbank include: Shanghai Fosun Industrial Technology Development Co., Wanxiang Sannong Co., and Ningbo Jinrun Asset Management. The bank has registered capital of RMB 4 billion (US$644 million) and a total of 300 employees, which is lower than traditional banks. 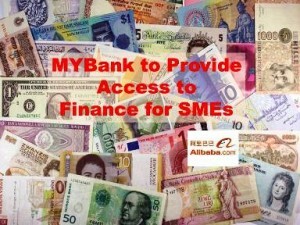 The business will focus on issuing small loans of less than RMB 5 million (US$805,500) for small business and consumers after regulatory approval.